Joni Mitchell Shares Her Morgellon's Story. Health authorities are debating whether or not this is a real illness, but people who are picking weird fibers out of their skin may have a different opinion. What are the symptoms of Morgellon's Disease? The story of Joni Mitchell's struggles with Morgellons parallels a lot of other issues dealt with by people who have been complaining of the same symptoms for years. Cramped legs, strange fibers coming from the skin, and pain that makes it difficult to even wear clothes are just a few of the problems that sufferers report. Added onto this, there is the psychological component of manifesting symptoms that are not recognized by the medical world at large. Morgellons Symptoms can present as a variety of complaints, which can lead to misdiagnosis and misunderstanding of this unusual condition. Because Morgellons disease is not currently accepted by the medical establishment, or thought to be related to hypochondria and delusional paranoia, a Morgellons diagnosis may be overlooked for some time. Some of the more extreme symptoms, like the feeling that bugs are under your skin or strange fibers growing from pores, can cause the sufferer long term anxiety, and this only gets worse when coupled with doctors saying that no such disease exists. Under any circumstances treatment for symptoms or conditions may at least mitigate the pain felt by sufferers of Morgellon's disease. 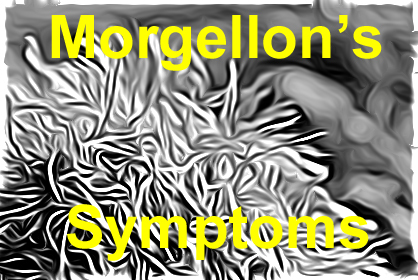 Symptoms of Morgellon's can include headaches, difficulty thinking, memory difficulties, wiry hairs, eye floaters, clumsiness, and depression. In children this may be misdiagnosed as autism or ADHD. Many of the specific complaints related to Morgellons are found in the skin, including strange fuzzy material coming from pores, itchy bumps and lesions, specks and dots on the skin, or odd rashes. Grains and granules may also come out of the skin. Some skin problems lead people to be unable to tell whether they are feeling hot or cold water, which can led to burns or scalding while showering or cooking. The cognitive and emotional effects of Morgellons can be just as disabling. Fatigue and joint pain may mimic depression, and the "mind fog" experienced can lead people to think suffers are absent minded, schizophrenic, or insane. Difficulties with mobility and muscle control can also have a psychological impact. Special note: Finding the symptoms of Morgellon's disease is easy but it is very important to rule out any and all other maladies that could be related to your illness. You may have one or more curable illnesses, or could be manifesting symptoms as a side effect of a medicine or a food that you are consuming. Get plenty of exercise, cut down on the cola drinks, and don't spend too much time in front of your computer trying to diagnose an illness. Remember that doctors are right most of the time, which is pretty good for humans, but you may need a couple of extra opinions before you settle on Morgellon's Disease. Make sure to get second opinions, since you may in fact have a different condition.